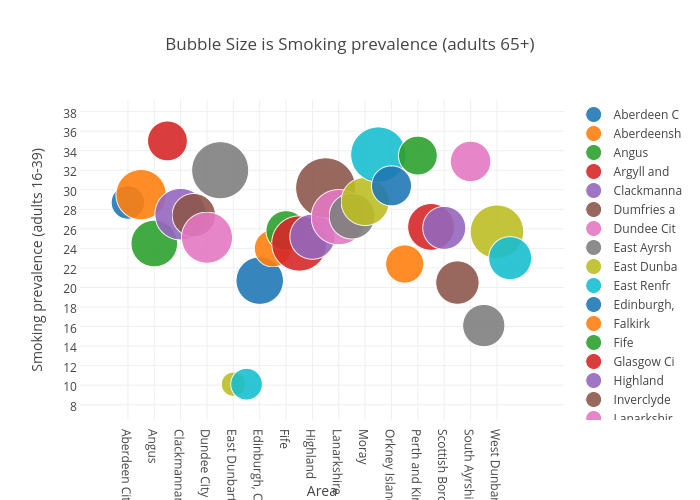 Billatnapier's interactive graph and data of "Bubble Size is Smoking prevalence (adults 65+)" is a scatter chart, showing Aberdeen C, Aberdeensh, Angus, Argyll and, Clackmanna, Dumfries a, Dundee Cit, East Ayrsh, East Dunba, East Renfr, Edinburgh,, Falkirk, Fife, Glasgow Ci, Highland, Inverclyde, Lanarkshir, Mid and Ea, Moray, North Ayrs, Orkney Isl, Outer Hebr, Perth and , Renfrewshi, Scottish B, Shetland I, South Ayrs, Stirling, West Dunba, West Lothi; with Area in the x-axis and Smoking prevalence (adults 16-39) in the y-axis.. The x-axis shows values from 0 to 0. The y-axis shows values from 0 to 0.